Phase 2 involved collecting additional images, together with an indication of regional weather. The multiple images are intended to show us more about the variability in conditions, and include Google Earth images, Google Maps images (unless identical to Google Earth) and Landsat images (from the year 2000, date unspecified). These Landsat images have been made into maps with scale and geographic information. 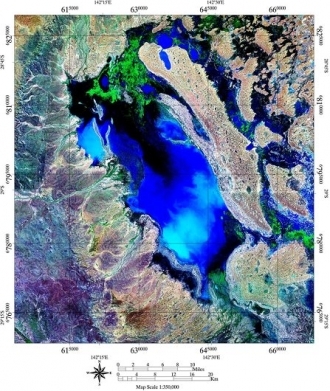 Many of the Landsat images show the desert sites as light blue, as seen in the view of Sevier Lake, Utah (right) rather than the white (for salt) or light brown (for alkali) that we are looking for. 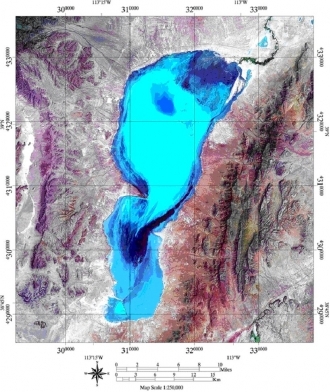 This is because many of the deserts are flooded when the images are taken – the light blue colour is the bottom of the lake seen through very shallow water, while darker colours indicate deeper water (which probably does not dry out during the summer). Light blue colouring is a good sign – if the deserts flood in winter and dry in the summer, then the surface is more likely to dry perfectly flat and smooth without any vegetation etc., on it. As an example of the Phase 2 process, the basin at the end of the Bulloo River in Australia appears to be a light brown mud/alkali surface (below left). While it has some uneven colouring, it is difficult to tell from the Phase 1 search image whether it may be suitable for BLOODHOUND. However, when we compare this image with the Landsat image of the same area, the dark areas to the north indicate deep water in a ‘sink’ area – this surface is unlikely to be smooth enough for us (see below right). Combine this ‘sink’ with the presence of the Queensland/New South Wales border fence and road running across the middle of the basin (the white line across the middle of the first picture) and we can effectively dismiss the Bulloo River area as unsuitable. This sort of refinement is the aim of the Phase 2 process. In addition to the imagery, climate data from the nearest city shows general climate suitability and gives a rough indication of the months (at the end of the dry season) when the surface is most likely to be dry – this is the time to schedule the Phase 3 site inspections. For example, the rainfall pattern in Karachi is an indicator of seasonal conditions for the Rann of Kutch just over the border in India. If we were to visit this site, Spring/early summer looks like the best time. 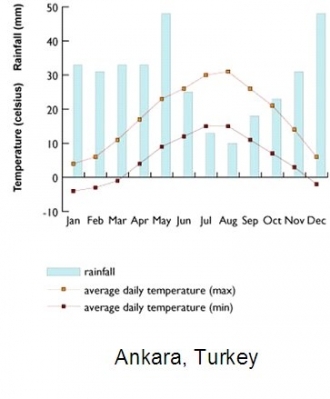 If we compare this with the rainfall for Ankara, near Lake Tuz in Turkey, the time to visit Lake Tuz appears to be September/October, before the winter rains set in. Looking further ahead, the sites in India and Turkey are likely to useable for BLOODHOUND at different times of the year – something we need to capture in Phase 3, so that we (hopefully!) finish up with a range of different sites and seasons allowing us to run the Car whenever we need to. With the Phase 2 process complete, it is time to take our reduced list and address the other factors that we need for a BLOODHOUND LSR site in Phase 3A of this search.